Feast your eyes on farm food with an elegant twist. The lunch menu features entrees loaded with fresh-picked vegetables, farm-raised lamb, beef and other local delicacies. Browse below, or download the full lunch menu in PDF format. Our chef is very happy to cater for special dietary requirements. Contacting ahead when booking would be appreciated. Please note a fee applies per person for all BYO cakes. Opening hours are Saturdays and Sundays between 11am – 5pm. 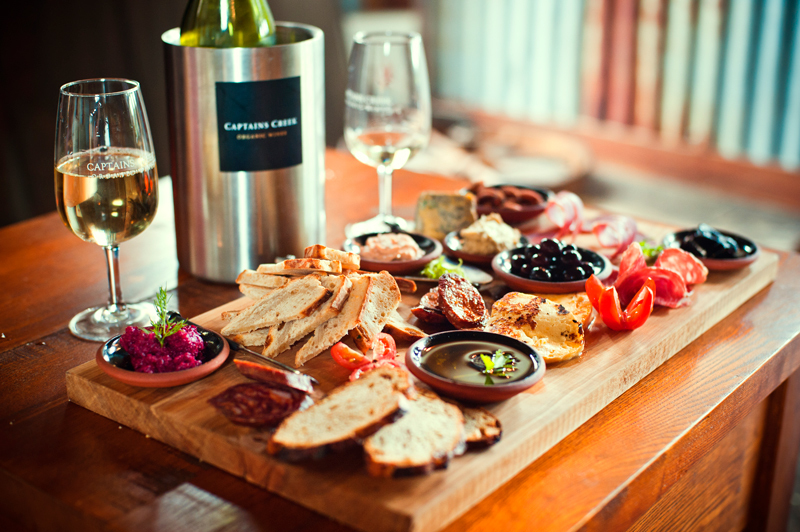 Local delicacies including a selection of Istra chorizo, salami and proscuitto, Captains Creek olives, marinated vegetables and house made dips served with sourdough bread. Gluten free and vegetarian options are available, plus a selection of cheeses. Poached pear in red wine served on a fresh salad of rocket, roast pumpkin, parmesan, proscuitto and walnuts with a cabernet pepperberry dressing $29 Gluten free. Vegetarian and nut free options are available.